Fashion fads come and go. What’s in today might as well be gone tomorrow. Even though these trends are highly unpredictable in nature, some piece of mind can still be found in those staple accessories that have been with us for centuries. You know, the likes of men’s scarves. For hundreds of years, men’s scarves have served the purpose of being the most essential pieces of men’s neckwear. Even though they’ve started off as purely practical accessories (dating back to the ancient Rome), men’s scarves soon took on the role of showcasing one’s social status or military rank. Rarely has a piece of accessory played such a major societal role as men’s scarves have. Exactly for that reason, I’ve decided to bring them back into the spotlight by presenting you with a brief scarf buying guide as well as my list of top ten men’s scarves on the market today! It’s sad that we rarely think about how some things came into being. Oftentimes, the genesis of things reveals new perspectives which help us better understand their cultural significance and overall societal importance. Even though the genesis of men’s scarves is most commonly tied to ancient China and Terracotta soldiers who used to wear them, scarves were actually first discovered in ancient Rome. Back then, they were called “Sudarium” (sweat cloth). Granted, as the name says it, these were primordially used for hygienic purposes and were worn around the waist. Nevertheless, as time passed by, they became an essential accessory when it came to formal gatherings, mostly as a means of discerning the social status of individuals. It wasn’t until the third century BC before the Chinese caught on with this Roman trend and introduced men’s scarves as rank-showcasing accessories within the military. The rest, as we tend to say, is history. From then on, men’s scarves only grew in popularity thus becoming one of the most relevant accessories in the history of men’s fashion. I know that it’s unnecessary to remind you that there are more than a couple of types of men’s scarves. Each and every distinct category serves a specific purpose and possesses traits which are highly desirable in different scenarios. Hereby, I’ll only mention my three favorite types: Sports, Winter, and Reversible men’s scarves. Sure, sports scarves aren’t the most fashionable ones but in regards to functionality and purposefulness, they’re the tip of the iceberg. Sports scarves are usually worn by extreme sports athletes. They are typically circular and made from very cold-resistant materials which are strangely quite thin. If you’re an avid skier or snowboarder, you know how important these are, especially because of their tangle-free nature which is, without exaggeration, a life-saving trait. These are the ones we all have in our wardrobes. For the common man, this is the most important scarf type. Even though you’ll mostly stumble across polyester ones, wool and cashmere are also highly popular and effective as a means of keeping the neck warm. As long as you have some decent mens leather gloves to accompany a winter scarf, cold weather won’t be able to harm you in any way. You may think that men’s neckties or bowties for men are what a true gentleman should be wearing around his neck. Well, I’m sorry to say that you’re wrong. The truth of the matter is that all true gentlemen have reversible scarves as their go-to neckwear. These contain two completely separate patterns which are perfectly woven together to create the ultimate piece of formal neckwear. If you really want to impress someone, just add a silk reversible scarf to your business attire. That’ll let them know who they’re dealing with. Wool is among the most common materials used for producing men’s scarves. Usually, it’s used for creating winter scarves due to its impeccable protection potential. To put it more plainly, wool is amazing at keeping you warm. Depending on how its woven, different styles and textures can come out of it just so that everyone’s likings can be suited. Of course, silk is the pinnacle of luxury materials. Whenever you find yourself choosing a piece of accessory, if it’s available in silk, go for it. The same applies to men’s scarves. Silk simply provides an incredible amount of softness and smoothness which make the whole scarf pop out even more. Heck, until recently, even some of the best men’s hats were made from silk. The word on the street is that polyester is the worst possible kind of material your scarf could be made of. Let’s break that notion once and for all. Polyester has so many praiseworthy traits which a lot of natural material are struggling to compete with! First and foremost, polyester is incredible when it comes to wind and water-resistance. Atop of that, it is often tougher and more durable than other types of fabric. Lastly, polyester is a miracle when it comes to resisting wrinkles. Finally, there’s cashmere. Like silk, it too is one of the most luxurious materials a scarf could be made of. The reason behind the steep prices of cashmere men’s scarves lies in the fact that cashmere goats can only provide a couple of hundred grams of fine underhair per year! Best of all, if you put it into perspective, one goat can provide enough fine underhair for only one scarf for the whole year! How crazy is that? I guess that explains the price, doesn’t it? Let’s kick things off with a scarf from a world-renowned brand called Alpine Swiss . Apart from designing some super cool scarves, they also make phenomenal men’s leather belts and other essential accessories. This scarf, in particular, is 100% acrylic. Now, some may be fine with that, as they have the right to be, but in the world of high-fashion, acrylic scarves are a big no-no. You see, this is a synthetic material which isn’t as breathable and soft as some natural fabrics are. However, it does provide wrinkle and stain resistance. That has to count for something, right? My thoughts on this scarf is that is decently made and priced. However, due to its lightweight nature, I’d be more inclined to use it when fall comes, because it doesn’t provide enough protection from the cold as a wool scarf would. Let me stop you in your tracks. Please don’t get carried away in thinking that this is a proper cashmere scarf! In fact, acrylic is the most common impersonator of cashmere. For an untrained eye, it’s fairly difficult to spot the difference between the two. Both are kind of soft and fuzzy, but the truth lies in the details. 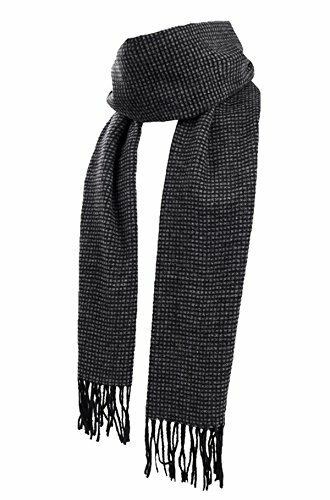 All in all, this Geoffrey Beene scarf is very affordable and decent men’s scarf. I love that there are a ton of colors and designs to choose from. It measures 12X60 inches which makes it just the right size for various occasions. By now, I think that most of you’ve had the opportunity to at least see someone wearing a shemagh. I’ll be the first to say that the shemagh might as well be the best piece of headgear ever created. 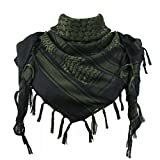 A regular old rectangular scarf will do its job just fine but the shemagh takes its protective role to a whole new level. Since it was created by middle eastern men who have to withstand the harshest of elements day in and day out, you know that it’ll serve its purpose diligently. Not only is it great for keeping you warm but it works wonders when there’s a lot of dust around, as well as wind. Traditionally, a shemagh is made from 100% cotton, as is this Explore Land’s model . Cotton does the best job of soaking in the moisture and being breathable. So, if you’re into outdoor activities, I wholeheartedly recommend you get yourself a shemagh. You won’t regret it. Whoever says that novelty accessories are suitable only for children, slap them across the mouth (please don’t, you’ll get in trouble)! There’s nothing wrong with being a massive fan of a particular movie or book franchise. In fact, I say that you should embrace that part of yourself as much as you possibly can. 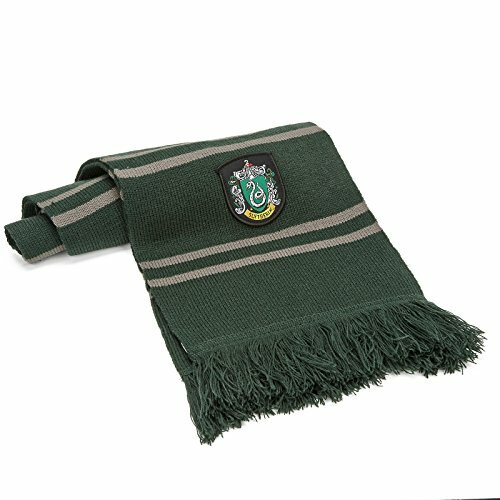 Therefore, here’s a scarf designed especially for the geeks among us. Oh, yes, it’s the Harry Potter scarf ! I won’t lie to you, the first time I saw the movie, I wanted to become a part of that world so badly. How could I not? Who doesn’t want to get involved with magic? Of course, apart from everything else, the costumes really helped make the movie even more immersive. So, if you’re looking for a cool acrylic scarf to wear when the winter comes or a perfect accessory to accompany your next costume party, I highly suggest you give this one a look in. Here’s a scarf for all of you chic people out there. If you’re really into rich and vibrant colors, then look no further than these Plum Feathers scarves ! These are 100% acrylic scarves which are really fine and soft to the touch. Size-wise, I’d prefer it if they were a bit longer but that’s a matter of personal preference. As far as the fingers go, these Plum Feathers scarves come with 3-inch ones. To me, that’s the ideal length. Honestly, if you have around $10 to spend on a scarf which will make your winter outfit “pop”, Plum Feathers might be the best choice you could make today. Even though it looks like any old plaid scarf you’d find in your local boutique, this Justay scarf would bring much more elegance to your wardrobe than you think. In fact, it’s made from Pashmina cashmere wool (70%) and silk (30%). This particular combination means that we’re dealing with a properly soft and gentle men’s scarf. You see, I’m not in agreement with people who are trying to save some money on their accessories. When it comes to a key holder or other non-essential accessories, I kind of get it, but when it comes to the ones that really make a difference, like men’s scarves do, I’m annoyed by it. This Justay scarf won’t set you back more than $20 but you’ll definitely be able to tell the difference between it and other low-end products. Size and Material: 67L*13W Inches. The mens scarf are 100% Acrylic scarf, super soft classic winter scarves. Style and Color: Trendy and versatile, warm and light weight, mens cashmere scarf perfect for all seasons. Brings you simple & effortless style. 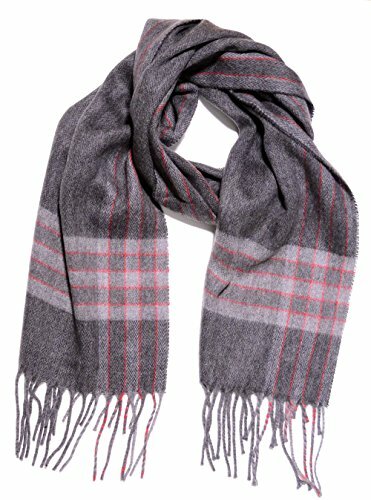 Black, camel, grey, navy, red plaid blanket scarf for your free choose. 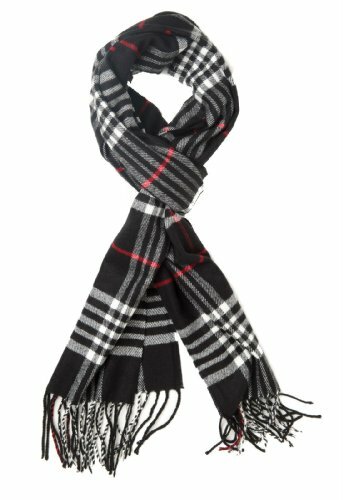 Occasions: Tartan scarf design, dress for the weather in style with a polished look to outerwear or sweaters, suitable for formal and casual. 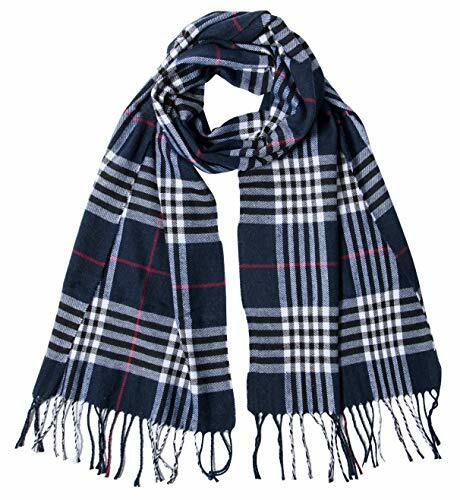 Care Instruction: The cashmere wrap should hand wash in cold water, hang or line dry, do not bleach, do not twist the plaid winter scarf. 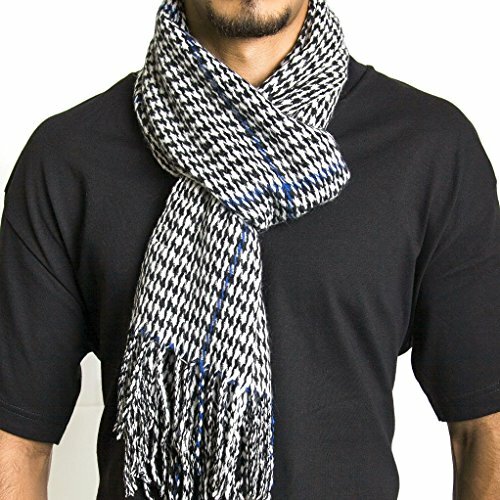 Great Gift: Mens mens winter scarves are an excellent gift for your lover, friend or father on any occasion. Here’s something a little bit different. Yes, you’ve read it correctly. This is a scarf made from very thin and soft bamboo fibers! Surprisingly, this type of fabric brings a new kind of softness and breathability onto the men’s scarves scene. For some inexplicable reason, these scarves remind me of the ones Sherlock Holmes used to wear. The original Sherlock Holmes starring Jeremy Brett, of course. Let’s face it, he’s the one true Sherlock and I won’t accept others (sorry Benedict). I’m trying to say that these scarves come with a certain vintage charm which truly makes them a contender for the title of best men’s scarves on the market today. They’re decently sized, come in various colors and designs, and are very effective against UV radiation. Oh, yes, bamboo is much more powerful than you could’ve ever imagined! Reduce radiation, effective against uv. 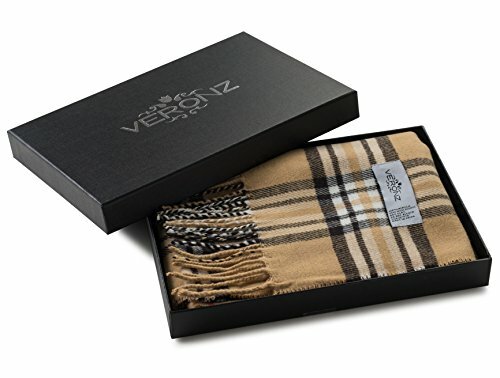 In case your looking to class-up your winter attire with a very fashionable cashmere-like men’s scarf, Veronz might have the perfect product for you. Not only is it very beautiful and soft to the touch, but it’s also quite affordable as well. These Veronz men’s scarves come in a plethora of rich colors and designs to suit everyone’s likings. They are made from acrylic which, as I’ve previously stated, does come with its advantages. Length-wise, these are pretty decently sized scarves (72’’ x 12’’). 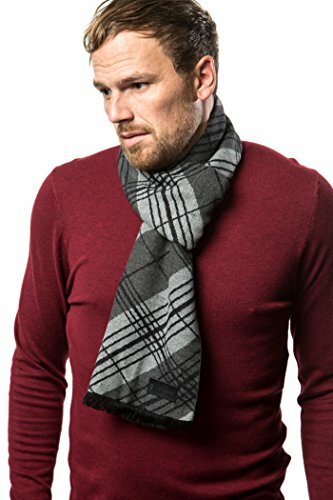 All in all, if you’re on a tight budget but desperately need a cool-looking scarf to keep you warm at all times, make sure to check out the Veronz. I promise you’ll be satisfied both with how it performs as well how it looks! Veronz scarves are sold exclusively by Sterling Attire only. All other sellers are violating the Veronz Trademark registered by USPTO serial no. 86288033. Veronz does not take any responsibility for quality, color matching, etc.. if purchased from any other seller. As far as looks go, this could be one of my favorite scarves thus far. Sure, you might say that it looks like a regular old plaid scarf and you’d be right. However, Love Lakeside provides an incredible amount of design styles and vibrant colors to choose from which can really help add some flavor to your outfit. Just imagine this scenario. It’s a cold rainy evening and you’re getting ready to pick up your date and take her to your first dinner together. You put on your most cherished pair of collar stays, snug into your warm coat, fling this amazing scarf around your neck, and you’re ready to go! Just don’t forget to bring one of your cool umbrellas with you! Let’s close things off with one of my favorite men’s accessory brands. I personally believe that MIO MARINO currently makes the best men’s leather belts but their scarves aren’t too shabby either. This one, in particular, is fully made from cotton and provides great insulation during cold winter days. Somehow, they’ve managed to pull off a cashmere-like finish which really does add a certain kind of smoothness to the scarf. Of course, it’s important to mention that it doesn’t lack on length. Its dimensions are 70.86’’ x 11.81’’. In case you’re allergy prone, it might be wise to avoid wool scarves in general because they do tend to irritate the skin quite a bit. The only other material which provides almost the same kind of insulation and is irritation-free is, of course, cotton. EXTREMELY COMFORTABLE AND MAGICALY WARM- Super breathable and lush, soft cashmere feel! Will keep you toasty warm on frigid cold winter days, yet comfortable and lightweight to wear around the house! Features superior plush cozy insulation that feel feather light on the body without witnessing the heavy sense of an ordinary wool, polyester scarf! Dimensions: 11.81″ Inches (30CM) Wide by 70.86″ Inches (180CM) Long. 100% COTTON – Exclusively made with high quality %100 breathable cotton fabric intended to eliminate the itchy wool crisis, and great for allergy sensitive skin! Quality tested to ensure maximum durability of construction, Marino exclusive, distinctive patterns and dramatic colors will retain its nice texture and will not fade or fray. 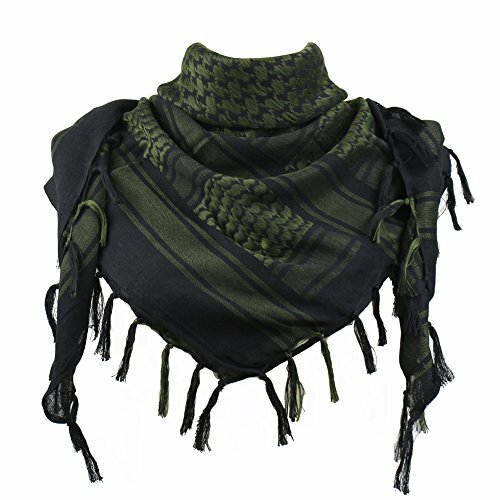 EXCEEDINGLY FASHIONABLE AND TACTICAL- Tired of replacing your scarf to obtain that smart voguish look? Treat yourself with this amazing scarf that is versatile and advantageous! It can be styled in boundless ways and paired with just about anything! Incredibly enhances plain jeans or formal pants! GREAT GIFTING IDEA – Stop the nerve-wracking, stressful search for a perfect gift solution, buy a Marino Men’s scarf for your loved one and you’ll resolve this issue in the most thoughtful way possible! It’s a classy looking scarf that feels like heaven! Every guy will enjoy a Marino Avenue attractive scarf to polish up their look!! ORDER WITH GRACE – If you are looking for a quality, stylish scarf with a plush cashmere feel, just add the Marino scarf to your cart, its 100% satisfaction guaranteed, 45 days free exchange and returns. Given that I’m a massive fan of innovative designs, in this very tight race, I have to give the edge to the Runtlly Bamboo scarf. Even though it might not be the most effective insulation-wise, it does provide a bit of everything. It’s soft, allows UV protection, possesses a certain vintage aura which instantly draws me to it. Of course, all of these scarfs will do the job they are supposed to quite well. As always, it all boils down to your personal needs and preferences. Whatever the case may be, I strongly suggest you give the Runtlly Bamboo scarf a look in.